Winning the War on Drugs in Mexico: Sí, se puede! The newly appointed US border czar will not prevent the flow of drugs and accompanying drug fueled insurgency from spilling over the border. Neither will building a bigger wall or militarizing the border. This is a systemic problem that requires a solution from within; namely, curbing American’s insatiable appetite for drugs and the cartels ability profit from it. When President Obama visits Mexico tomorrow he should present a renewed US-Mexico partnership to bolster Mexico’s weak police and justice system, curb political corruption, curb US drug demand and the export of US assault weapons to drug cartels. Until then, the situation remains grave. Today more than 90 percent of the cocaine in the US, worth an estimated 25 billion dollars, comes in through Mexico. 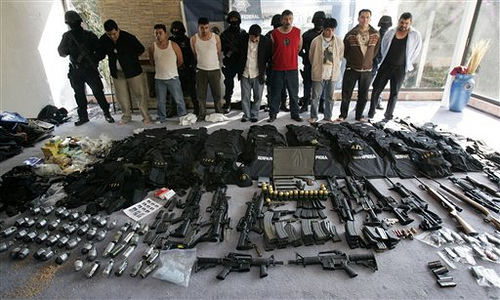 At the nexus of crime and drugs, militant groups-like Hezbollah-have teamed up with Mexico’s drug cartels, whose estimated 100,000 foot soldiers are armed advanced weaponry. Adm. James G. Stavridis, commander of U.S. Southern Command, recently testified before the House Armed Services Committee that there “is a growing threat” that terrorist groups are using the same “routes, profits, and corruptive influence” as drug dealers. Drug cartels have even adopted tactics reminiscent of Middle East terror groups, broadcasting decapitations of their rivals on YouTube, detonating improvised explosive devices and assassinating political leaders in a deadly drug fueled insurgency that claimed over 7,000 lives since January 2008. Intensified border security is necessary but is not a panacea. Similar measures were taken following the attacks of Sept. 11 and reduced access to the US by air and water but actually encouraged criminal networks to rely on Mexico as a transit route for smuggling operations. Instead US policy makers should consider the advice from former presidents from Brazil, Mexico and Colombia to end its “prohibition” policies and legalize marijuana. The taxes from legalizing marijuana could be used to go pay for long neglected treatment programs for more addicting and detrimental hard drugs. It has long been known, that treatment programs have been more successful at decreasing drug use in the US than incarceration. Treating drug addiction as a crime rather than a public health problem has cost this country billions of dollars in lost tax dollars, fueled drug violence, and filled up our prisons with people that need treatment, not jail time. Congress needs to act on Atty. Gen. Eric H. Holder Jr.’s suggestion to restore its ban on the sale of military-style assault weapons. There is something hypocritical about cracking down on hard working illegal Mexican immigrants, but ignoring the more than 6,000 US gun stores on the border of Mexico that cater to drug cartels. But it’s not just the guns we have exported. We have exported a culture that romanticizes drugs. From narcocorridos, a new genre of music that transformed traditional norteño music into drug ballads to the dress of Los Angeles’ street gangs, Mexican drug traffickers have adopted an American pop culture that romanticizes outlaws. These outlaws have become folk heroes and role models for the next generation of Mexican youth. The US backing out on NAFTA agreements has exasperated the problem by decreasing the number of opportunities this generation can aspire to through legitimate means. Though systemic problems need to be resolved from within the system, President Obama can spur change in Mexico by offering support for a comprehensive solution to these problems. If changes don’t come soon, America’s neighbor and largest trading partner could easily become a failed-state and its violent insurgency spill over the border.